Often choosing the right glass is more difficult than choosing the right wine. What is more important to the wine connoisseur? A cupboard full of glasses or a cellar full of wine? Pessimists are ostracized because in this case they describe the glass as half full rather than half empty. Optimists would never fill a wine glass half full. The modern way to optimally enjoy the intense taste of wine lies in the small quantities. The wine in the glass should be presented optimally. At home almost every wine connoisseur has an arsenal of many different glasses. Motto: Better too many glasses than too few! And as creatures of habit we usually use the same glass anyway. Thus – without even noticing it – we all select our own favorite glass. The rest of them, mostly large glasses are just there for show. In my 30-year career as a wine connoisseur I have tasted tens of thousands of wines. In many forms: on tap, at wine cellars all over the world, at rare wine tastings, at public events, at wine tasting parties and of course at private residences. Although the standards for glasses have improved in the recent past, in many cases I would have preferred a «better glass».Because as soon as there are many people taking part in a wine tasting where many wines are presented quite often substandard glasses are used and this decreases the enjoyment of the wine. The glass always comes between us and the wine. And it is precisely this glass that should not detract from enjoyment, but instead should make the wine enjoyable. The top wine makers will do everything in their power to bottle everything provided by the vineyard, the grape varieties and the weather. And this of course should also be apparent in the glass. An optimal glass should support and promote a blend of «aroma, facets and volume.» For a connoisseur a great wine is always a blend! Because every drop is a mixture of: grape varieties the terroir, its origin and its vintage. It is also important to know whether the wine was vinified in a traditional or modern manner; fermented in steel tanks or generously aged in new oak barrels. And each of these elements should influence the selection of the proper glass. There is nothing worse than feeling like you’re drinking out of the wrong glass! You know it’s the right glass when you don’t notice it and the wine is presented optimally. For many years I’ve looked for a glass that would meet my own personal needs; from my daily wine enjoyment to the rare wine tastings that I organize. At home I had a plethora of test glasses. But there is nothing suitable for the glass egg of Columbus. 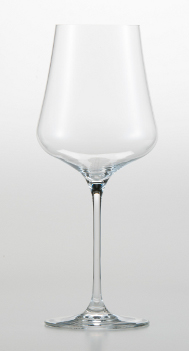 For a long time, I’ve known precisely how the Gabriel-Glas should look. 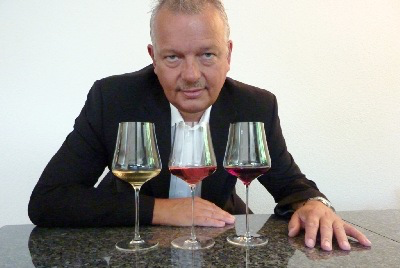 Through intense collaboration with professional glass designers and the renowned wine critic René Gabriel the unique GABRIEL-GLAS © was born; medium-sized, elegant and affordable. Where expert glass creation meets the knowledgeable connoisseur. Pure enjoyment! Every day! Every wine! Cheers!